I find it interesting to see how an image evolves from starting concept to finished product. With some images, it is clear that they are keepers from the very start. However, with others, their potential might not be immediately obvious and they just sit somewhere (in the drawer, on your hard drive....wherever). Then, at some later point in time, the photograph gets 'rediscovered' and viewed in 'a new light' and with fresh ideas. That is what happened with a shot that I have recently been working on. I initially posted this picture in my last blog entry entitled "I Like It", which was about Adobe Lightroom. The evolution of this image is, I think, interesting, and illustrates why I rarely delete images unless they are grossly out of focus or hopelesly incorrectly exposed. After seeing the image again, I thought it might be worth pursuing if I could somehow get it to express what I was thinking and feeling at the time I took it. The white tree appeared unique compared to the others in the background and had a large area where it was standing alone. It almost seemed as if the non-flowering trees were giving the 'queen' of the trees a wide berth. The color infrared treatment that I had found seemed to give it just what I felt it needed. The result was the image below, which, again, I posted in my last entry. At this point, I thought I was done with the image. However, the more I looked at it, the more I was dissatisfied and felt that it still needed more to bring out everything I wanted it to convey. 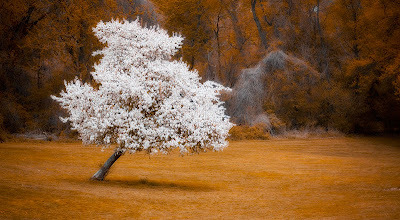 I wanted it to take on more of an ethereal, surrealistic feel to go along with the unusual color of the infrared effect. I had recently been reading about digitally mimicking the so-called Orton effect. 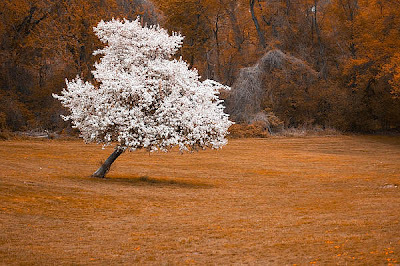 This effect was described by and named after photographer Michael Orton, who took two overexposed images of a scene, one in focus and one out of focus, and combined them together as a 'sandwich' in one slide mount in order to generate a soft, surreal, painterly effect. The basic technique used to generate the digital equivalent is described here. I had never tried this before, and this seemed like the perfect first image for me to experiment with. I liked the result....but there was still something nagging at me. I felt that the 'queen', to maintain her regal feel, should not be as blurred as the other trees in the background and that more emphasis was needed on 'her'. The emphasis was easy to create with a gentle vignette. However, localizing control of the Orton effect seemed unattainable, with my only choice seemingly to increase or decrease the blur in a global fashion. The effect is a bit difficult to appreciate with even the largest image size that Blogger allows, which is still quite small. If interested in seeing a larger version, I posted one on the Fred Miranda forum in order to receive some feedback. The larger version can be seen in that forum here, as it is not yet on my website. Here is the excellent video tutorial by Bob Campbell that describes the three layered Orton technique. Give it time to download....it takes a few minutes to load, but it is worth the wait. I think the evolution of an image over time is interesting. In the digital age, one can always run into the problem of taking continued adjustment and manipulation too far. I hope I have not done that here, but, in my mind, this final version seems to express what I was after much better than the prior attempts. In the end, I am quite happy that I had not deleted this last year.